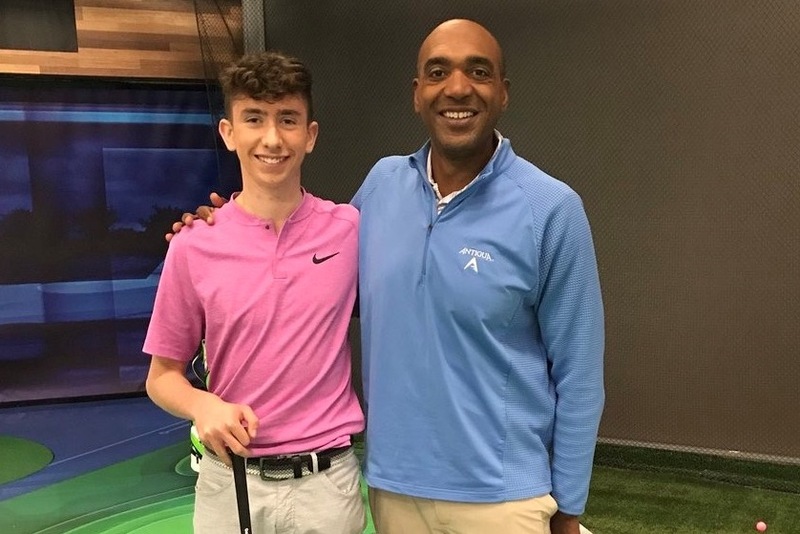 Ultra-talented Irish teenager Tom McKibbin reckons he’s getting used to being dubbed – “The Next Rory McIlroy,” with the 15-year old McKibbin formally introduced to the American golfing public with a ‘stardom-like’ appearance on Saturday on The Golf Channel. McKibbin was welcomed and interviewed by Damon Hack, a former golf writer with Sports Illustrated who has been with the Golf Channel since 2012 and is currently one of the more-knowledgeable co-hosts on Morning Drive with McKibbin informing Hack he began playing golf at the age of seven when he was out playing soccer with his friends. McKibbin, who is now six-feet tall, arrived at the Orlando studios with his golf clubs and Hack had him hit a few shots, but before hitting a first practice ball asked one of those quintessential ‘Americanised’ questions. “What’s your ‘thought-process’ standing over a shot with a golf club in your haaand (word drawn out),” said Hack. Hack quizzed McKibbin that knowing McIlroy and if being buddies with Rory, leads to any extra pressure and also with McKibbin already being labelled the next ‘Rory McIloy’ and whether that’s a little bit odd? McKibbin agreed the best aspect of his game was his driving while his iron play has become a ‘lot better’ but he loves hitting the driver. But before hitting a shot there was then another double-barrel enquiry from Hack. According to The Golf Channel’s studio ‘Trackman’ McKibbon hit the ball 316-yards with a carry of 303-yards. “How much do you pay attention to those numbers? Are you into Trackman and do you do you know your ball-speed, swing-speed and how much are you into the numbers, the data?” Hack asked. “Uumm, I have been onto Trackman a few times to gauge my swing-speed just to see how fast I can hit it sometimes,” said McKibbin. Hack then quizzed are you a fader? Are you drawer? What’s your natural swing shape? “I would say I naturally draw it, my game is fine with the draw,” he said. Hack’s next question: “Alright, let’s see another swing with the driver. I mean this is powerful and you’re not even done growing. What are six feet tall”? “Yes, six feet,” McKibbin confirmed. Hack remarked: “Fifteen years of age, ladies and gentleman. That’s a carry of 303-yards and 316-yards. He’s already played in the Shot Clock Masters on the European Tour. What was that experience like? I would have been shaking in my shoes”. Hack rekindled fond memories of McKibbin grabbing a second-round 6-iron hole-in-one earlier this year in the Nick Faldo hosted Major Champions Invitational and on route to victory on the Orlando course also designed by Faldo in 2002. McKibbIn’s win came on the same weekend McIlroy captured the Arnold Palmer Invitational and with victory at the Major Champions coming soon after success in the Under-18 Junior Honda Classic and Doral Publix Jnr Classic Orangebowl Championship. And in conclusion Hack asked if McKibbin had aspirations also of joining McIlroy in becoming an Open Champion? “Obviously, that would be a great dream of mine but just to professional golf and to do as good as I possibly could would be beyond wild”.